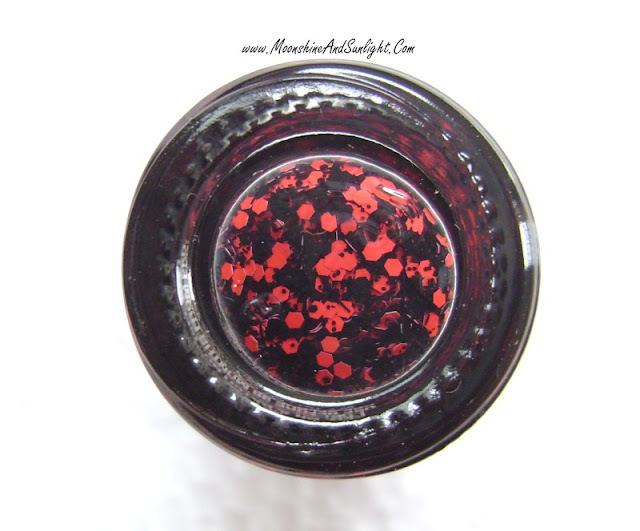 Red Splatter Go Graffiti Top Coat Review and Swatch || Colorbar Black Fiesta Dupe? In India women mostly preferred plain , one color nails but suddenly ( Thankfully!) The companies like L’Oreal , Maybelline , Colorbar , etc have started launching variety of top coats with different types of glitters and sequins, which makes achieving pop and fun nails without much efforts so easy ! Colorbar had entered this space quite a while back, L’oreal was next in launching the 7 top coats, out of which I got Confettis, something similar to Clearly Spotted of Maybelline ( Not launched in India), But now finally Maybelline launched some top coats this summer in their #RebelBouquet collection. They launched the Go Graffiti Collection! 9 shades to be precise, 3 jelly polishes in pastel shade, 3 top coats with mainly black hex sequins and the other 3 with three different shapes of chunky glitter of heart, star and flower shapes. These are priced at 145 INR each , which is pretty good considering the prices of colorbar and L’Oreal ! ( Still Colorbar offers a large of amount of the product). Let’s see how I liked this one and then I will tell you which other one I bought. Packaging: - The standard Colorshow packaging with the name and shade number engraved at the top. Brush: - The same as Colorshow brushes, though this being a glitter top coat I had expected a better, sturdier brush. But since, the glitters are of similar shape it doesn’t pose much of a problem. Shade: - Three sizes of black hex sequins ranging from tiny(micro) to medium along with black strips and bright red hex sequins of medium size in clear , glossy base. No shimmers. I am wearing this on top of my two favourite white polishes! The pictures do not do it justice! I hate leaving my camera at home!!!!! The polish stays on for a long time, as long as a week, but taking it off is a pain! I like this and love how it peps up my everyday polish, so the pain is okaayyy. The other two shades have blue and green hexes in place of red, so I didn’t want almost repetitive stuff in my stash. I got one more top coat but no jelly polishes. I didn't like any of those personally. So, I am sure you would have got one for yourself by this time!! Which one did you get ? ?